I discovered Paul Sarz and his jewellery shop when a girlfriend was wearing a golden mustache around her neck! From the very first time I fell in love with this strange, special jewellery. After a while these “mustaches” became really famous among the hipster girls of Athens! It was about time to visit Paul and his jewellery shop! Not only for his “famous mustaches” but also to see all these great handmade jewels he makes himself! Ever since then I feel that I have to spread the news! Paul has been running his shop since April ’10. He is passionate about “Sentimental jewellery” – something you can discover when you visit his shop. Earrings, bracelets – all with a tender, nostalgic feeling. An ideal place for girls and boys that love the dark and goth aesthetics! And also ideal if you are looking for a special present for yourself or your friends. 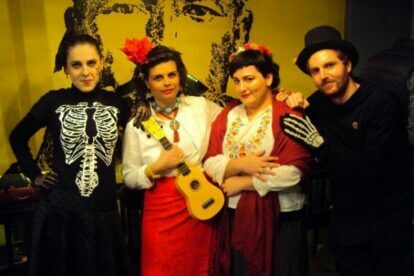 In the pic you see Paul and his friends celebrating “dia de los muertos”.